The black bear Ursus americanus is one of the most familiar wild animals in North America today. The black bear is a bulky and thickset mammal. Approximately 150 cm long and with a height at the shoulder that varies from 100 to 120 cm, an adult black bear has a moderate-sized head with a rather straight facial profile and a tapered nose with long nostrils. The ears are rounded and the eyes small. The tail is very short and inconspicuous. A black bear has feet that are well furred on which it can walk. Each foot has five curved claws, which the bear cannot sheathe, or hide. These are very strong and are used for digging and tearing out roots, stumps, and old logs when searching for food. 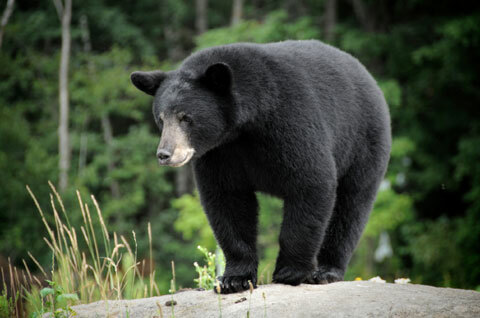 Habitat: Although found in a variety of habitats, the black bear prefers heavily wooded areas and dense bushland. Maximum numbers probably occur in areas of mixed coniferous–deciduous forests, where human presence is low. Diet: Black bears will eat almost anything available. Most of their food is plant material, especially in the late summer and autumn when berries and nuts are available. Insects such as ants rate high, and black bears will overturn logs, old stumps, and stones while hunting for food. Fish, small mammals, and birds are sometimes on the black bear’s menu. Mating is in June or early July, and the cubs are born the following January or February while the mother is still in her winter den. This may seem like a very long gestation period, but in fact the embryos stop growing a few days after fertilization and do not implant in the uterus until the beginning of the denning period in early November. In late summer and fall the female eats as much food as possible in order to gain weight. If she weighs at least 70 kg when she enters her den, there is good chance that the embryos will implant and gestation will continue. Q. Every year I hear about black bears getting shot because they are seen as a threat to public safety. Instead of killing them, why can’t the bears just be moved to a new area? I’m planning on doing a lot of hiking this summer. But I’m a bit worried about running into a bear. Should I play dead if I encounter one?